Wolf Construction is the premiere builder of custom homes in Aiken, SC. Whether you are retiring to Aiken, relocating or are an Aiken resident looking to build your new home, we have the team that can make your dream home a reality. We build Aiken custom homes that are anything but unoriginal or “cookie-cutter.” With our team, professionalism and resources, we will work together closely with you to ensure that your vision for your home becomes a reality. You can choose from our pre-designed house plans or work with our team to come up with your one-of-a-kind home. 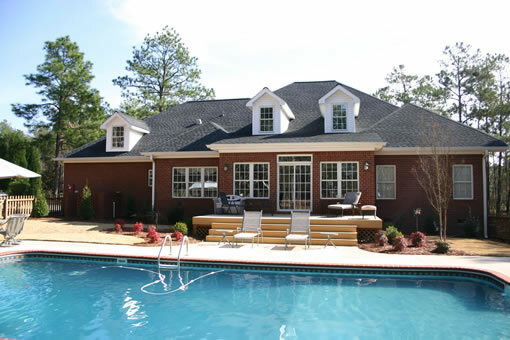 Our design of Aiken custom homes, our commitment to outstanding customer service and our attention to detail all guarantee that your family will love working with our team. We build in different equestrian and golf communities as well as other quality Aiken neighborhoods from which you can choose. Our neighborhood building sites include Cedar Creek, Three Runs Plantation and Mount Vintage. When we build Aiken custom homes we take what can seem like an overwhelming process of designing a dream home into a process that you will actually enjoy. Ready to set up an appointment or have a discussion about your next home? Give us a call at 803-649-1711 or send us an email.